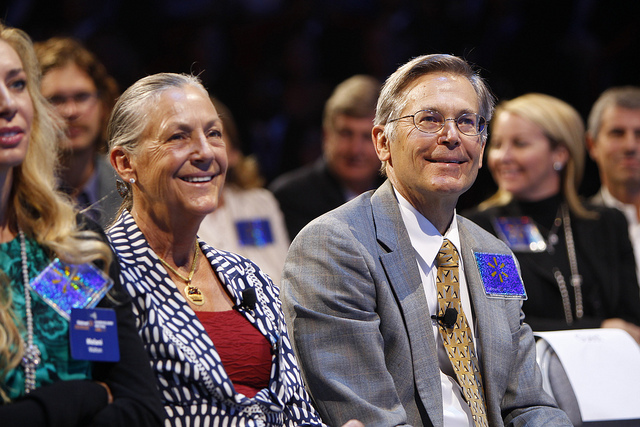 Alice Walton and Jim Walton, children of the Wal-Mart founder, at the 2011 Wal-Mart shareholders meeting. Each has assets of over $30 billion. I am often haunted by moral questions or conceptual puzzles, sometimes for years on end. In the last couple of months, I made some leaps in my understanding about several such issues. For many months now I was haunted by my inability to understand, from within, members of the Walton family, the owners of Walmart. This practice, of understanding from within, is one of the core foundations of how I do my work, both when engaging with people and when writing. I do not include anything analytical in it, because the analysis separates, and I am looking for connection, for the felt sense, the vibrant humanity. And I couldn’t apply it to the Waltons, because I couldn’t find a way to explain to myself how, as a Walton, I would live with the knowledge of having billions of dollars to my name while my full-time workers need food stamps to cover their most basic needs. I couldn’t fathom what I could only understand in terms of a colossal lack of care. Last week, I finally put the pieces together and “solved” the puzzle. What I realized in a moment of sharp and instantaneous insight that came from nowhere and hit me at the core was utterly simple: the Waltons and I see a different reality. Within the reality that I see, everything is connected, because we are in a closed system, in which nothing is created, only converted, transformed, or moved from one place to another. Over the course of millennia we have steadily made more resources available to humans for consumption. Some of it is clearly based on technology and gains in productivity, and so much of it is based on immense cost to the planet and the biosphere. This year it was on August 8th, Earth Overshoot Day, when we started consuming collectively beyond what can be regenerated within the year, thereby having a debt towards future generations. Also, within a closed system, for one person to have more resources, someone else must have fewer resources. In this way of seeing the world, human wealth is always taken from somewhere; never created from scratch. Within the reality that the Waltons and so many others see, the system is open, although I doubt many people would ever use those words. They truly believe and experience themselves as creating wealth where there was nothing before. For those who believe in an open system, everyone can in theory be rich, if they only work hard enough, have the right capacities, apply themselves to life differently, or what have you. If they are not, it’s because they are incapable of it. The poverty of many and the wealth of some are entirely unrelated in this way of understanding life. Why is this important, you may ask? What do we gain by having an imaginary understanding of a Walton? For me, there are several gains, each of which is crucially important for me. A World that Works for Whom? Given my profound commitment to nonviolence, I want to be able to understand and have an open heart to anyone, regardless of how much harm I believe they create in the world. This is what it means to me to move in the direction of a world that works for all: it will have to also work for the Waltons and others whose actions terrify me. This is the vision at the heart of nonviolence. It is dramatically different from the other project that humanity has been on for the last several thousand years: differentiating the good guys from the bad guys, and making the world work for all the good guys, in part by eliminating, ideally once and for all, the bad guys. This is the myth of redemptive violence that Walter Wink speaks about in The Powers that Be. Another way of saying it: any time I am unable to understand anyone, I am giving in to separation, manifesting as seeing that person as “other”, different, and, ultimately, even if only slightly, less human than me. This is a slippery slope, as the history of bloody revolutions shows so clearly. Our collective task, as I see it these days, is to wrest our consciousness from the grip of the divided world and reclaim and expand our capacity to root for a world that works for all. It starts with caring for all, right now in this world. This is what I do by humanizing the Waltons to myself. Humanizing the Waltons goes way beyond my own commitment to nonviolence, important as that is for me. This personal breakthrough also shapes my understanding of how things work. Specifically, as I recover, ever so haltingly, from my own inability to expand beyond my own terms which led me to see so many people as not caring, I am now more able to see the apparent lack of care as itself a product of separation. When the causal link or any other relationship between the wealth and the poverty is erased, the person with wealth can have generic sympathy for the poor without seeing any reason to act differently. There is no moral dilemma any more than there is about any other form of suffering. I wouldn’t have been able to get to this understanding without a prior piece of clarity that descended on me and helped me understand what separation actually did in the world. For this, I had to overcome a piece of separation within me that was showing up as a strong aversion to the concept “abundance”. I knew that I was being reactive, because of my deep concerns about how much abundance has been intertwined with the idea of “prosperity” that strikes me, once again, as a manifestation of not seeing that we live in a closed system, in which prosperity can only come at the expense of others. Gradually, and in large part through my exposure to the thinking about the commons and about gift economies, I came to see the difference between abundance and surplus, and finally, all in one lightning bolt, I got to understand that what we have done as a species was to convert natural abundance to artificial scarcity coupled with artificial surplus and excess. Let me unpack this fully. I now see abundance as a fundamental aspect of life and nature. It’s not about too much; it’s about there being enough ongoing flow of resources to continue to sustain life in all its intricate relationships. It includes within it adaptation to the ups and downs in resource availability which all life forms excel in doing. This is the fundamental mystery of life: there is life, death, even killing, and yet it’s all in an amazing dance of interrelationship and a thriving ecosystem balance. Surplus, or excess, is different, and more so the more it is the result of conscious accumulation. Abundance depends on flow, and accumulation removes resources from the flow, making them less available to life, only available to those few individual humans who are doing the accumulating. Why did we do this? Why did some of our ancestors decide to begin accumulating, or even to begin the process of interfering with the natural flow by forcing nature to grow things on a human schedule (aka agriculture)? I am in deep humility as I say what I am about to say. Even though I experience it with a degree of clarity of “knowing” that is striking to me, I know that I don’t know what happened to our species; I don’t know that anyone will ever know, no matter how much archeological evidence and ingenuity we bring to it. So this is only my conjecture. It seems to me that at a certain point we may have experienced higher than usual degrees of scarcity that led to loss of trust in the flow and abundance of life, and from there to the possibility of having enough to keep for the future once dry goods were a possibility. From there, accumulation in the hands of the few was a sad short step, fueled by scarcity and reinforcing separation. We’ve been at it ever since. Understanding the Waltons better also gives me a deeper, more resonant understanding about why, in general, it’s so often challenging to talk with people about privilege, especially their own. For the last year or so there has been an ongoing conversation about the topic of power and privilege on the email listserve of certified trainers with the Center for Nonviolent Communication, of which I am a part. I am so relieved and excited that we are finally taking on this conversation, giving me hope that we will, collectively, make some important leaps in our effectiveness as a network of practitioners. I am also, at the same time, heartbroken about how difficult it’s been to have the conversation move towards convergence in our collective understanding about how to speak about privilege. Odd as it may seem, this very challenge also adds to my excitement about having the conversation. It helps me see just how extremely challenging it is to bridge the gap of understanding about how the world operates. The people who are part of this listserve are my beloved colleagues. These are people I hold in very high esteem, who are very committed to the vision and principles underlying the practice of Nonviolent Communication, fellow travelers open and eager to engage in significant conversations. We are all skilled at listening and at speaking with a high degree of transparency about inner process. If there is challenge there, and if we can figure out how to come together, then this can help those of us who are aching to find a breakthrough in the larger conversation about these topics. Understanding the Waltons is giving me a clue about the challenge in this conversation. Not entirely a new clue, and still, a deepening of what I know. It helps me understand even more fully than before why it’s easier for at least some people to talk about “social location” or even “unearned advantage” and not about “privilege”. The word privilege, as I understand it, signifies not only the benefit to the person having it; it also points to the relationship between that person’s benefit and someone else’s lack of benefit. While I knew it before, the understanding of the difference in perspective between closed system and open system really helps me have more compassion – both for the people who are not seeing what I am seeing, and for me and others in our exhausting and often unsuccessful efforts at conveying to others what we see and understand. I do not have answers. Maybe I won’t ever have them. I am not delaying speaking of what I discover just because it’s incomplete. I see reframing the question as a step in the direction of clarity and hopefully movement. The new question for me is how to help people connect the dots. The challenge is huge. First, because these connections are not usually directly observable. (Note that the same challenge applies to why people don’t agree with there being global warming.) Second, because seeing the connections is bound to create immense discomfort, and thus there is every good reason for the connections not to be made. Sobered and excited, I end this piece open to learning more. From Dave Belden: my apologies that this went out under my name to begin with–I forgot to log in as Miki while posting this for her. 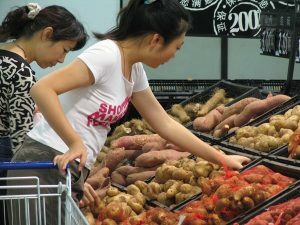 This entry was posted in Uncategorized and tagged abundance, Earth Overshoot Day, Privilege, scarcity, Wal-Mart, Waltons on September 16 / 2016 by Miki Kashtan.